I’m so excited over a soap that I can’t wait until later in the day (it’s almost 2:30 AM here lol). I had a short boost of energy resulting from getting out today and took advantage of it to experiment (again) on a duck soap. 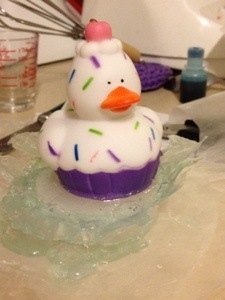 Larry liked the wet look to the 4th ducky in the batch I experimented on a few days ago. 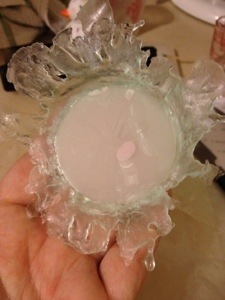 We both agreed that the shredded soap just doesn’t fit my mad scientist personality. He asked me why couldn’t I do the extra pour around the soap and then turn it upside down, using that as the duck cupping side. I took that idea a bit further and used wax paper in shapes to let me control the soap a little better. I was able to get the “water” soap to look like it was really splashing and I did a second pour with different crinkles in the paper, so there are some almost lacy-like edges to some of the “water”. 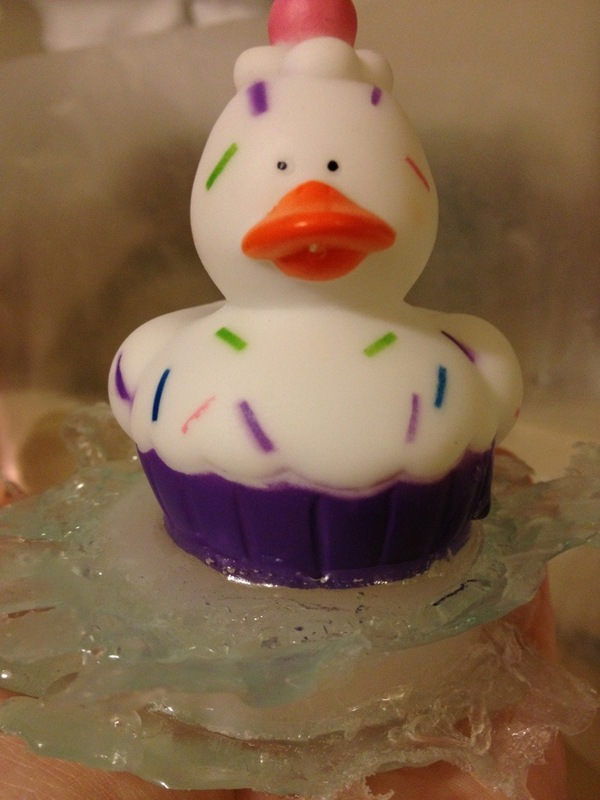 *smile so wide I may crack my lips* A little shred made it into my opal-like soap round, so there’s a tiny pink spot on the inside, but that’s covered by the ducky. The first pic is the first water splash (and you can see that annoying little accident), the second is at half of the second stage, and the third is the cutie patootie result, sitting on my hand. The skin tone helped the ice blue water really pop in the pic, so I am even happier. If people like these I think I can do a few “At the Fair” variations of duck soaps to go in the Easter and summer kid combos. Posted in Uncategorized and tagged bath, Homemade, soap. Bookmark the permalink.